7 Kids and Us: Platinum 7x Vodka For 4th of July! Platinum 7X Vodka has created a recipe to put the boom in any Fourth of July celebration this holiday. The ultra-smooth American made vodka, distilled seven times from high-quality Midwest grain, offers a taste of thoroughly executed tradition, excellent for making a patriotic cocktail as the nation celebrates its 238th year of independence. 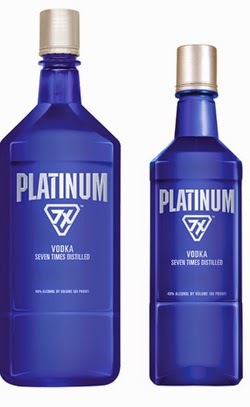 Platinum 7X, conveniently sold in a lightweight and stylish plastic blue bottle, will ensure all celebrations remain "uncrashable" this Fourth of July, and allows consumers more flexibility and portability while enjoying the smooth crisp taste under the fireworks. The Firecracker (makes 1)Rimmer: Before you make the cocktail add a small amount of water to a plate, just enough to coat the bottom. Then add a layer of Tajin (a mixture of salt, lime zest, and chili seasoning) to another plate. 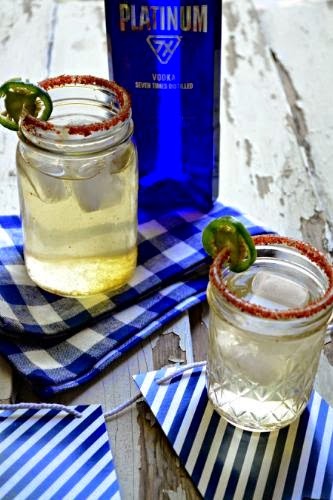 Dip the rim of the glass into the water and then into the seasoning. Slightly swirl the glass in a circle to make sure the seasoning coats the rim. Combine all ingredients in a glass. Stir and then sip! Recipe and photo by Stefanie Bundalo, http://www.sarcasticcooking.com/.